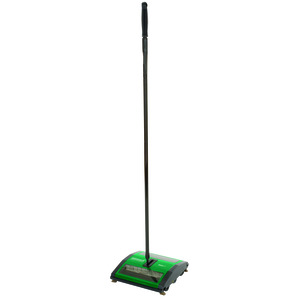 BISSELL BigGreen Commercial manual sweeper with 2 rows of rubber rotors. Easy-empty dirt bin with viewing window. Great for large and small debris. 7-1/2-inches wide cleaning path is great for large and small debris. Cleaning path: 7-1/2-inches. 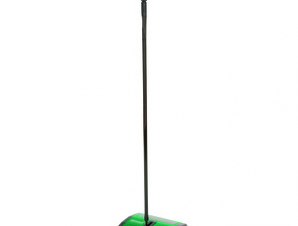 Cleaning surface type: bare floors, low pile carpet. Wheels: soft rubber. Handle type: galvanized steel. Soft bumper. 1 Year limited warranty. Green color.